The Bulls are gone and why that’s good news! The latest outcome of the weekly AAII Investor Sentiment Survey revealed that bullish investors are historically scarce. Less than 20% of the individual investors surveyed by the The American Association of Individual Investors, AAII, expects the equity market to go up in the next six months. And that’s quite extraordinary. Out of the almost 1500 AAII surveys held since July 1987, the share of bullish investors dipped below the 20% threshold in just 27 occasions. That’s less than 2% of the time. Since 1991 this happened only six times, so it seems appropriate to say that individual investors are historically bearish. But what does it mean? The answer is pretty straightforward. If history repeats itself we should be in for some healthy S&P returns going forward. As the table below shows, the returns following the 27 survey readings in which the share of bullish investors fell below 20%, have been higher than the overall average. And significantly so. For example, the return after 26 weeks of publication, roughly the six-month horizon that the investors are asked about, has averaged 13.3%. Against an average of ‘just’ 3.7% for all 26-week return periods. That is 3.6 times better than average. For other holding periods the same conclusion holds. When individual investors get very, very bearish, returns have been way above average after. There is one caveat with these results, however. When translating the AAII survey data into an actual investment strategy, not all weekly outcomes are relevant. If you decide to put all of your money in the S&P 500 Index for a period of 12 weeks immediately after the percentage of bullish investors drops below 20%, you won’t be able to ‘use’ the AAII survey outcomes in the 11 weeks thereafter. Simply because you already invested all of your money. To account for this, I adjusted the average return data for the investment horizon (4 weeks, 8 weeks, and so on.) These adjusted returns are shown in the table below. They are pretty similar to the previous table. A historical drop in the percentage of bullish investors has historically provided a buying opportunity. The return differential between the AAII-based investment strategy and the overall average return remains very large. Only for the 52 week return period is the difference less outspoken, which could have to do with auto-correlation effects. 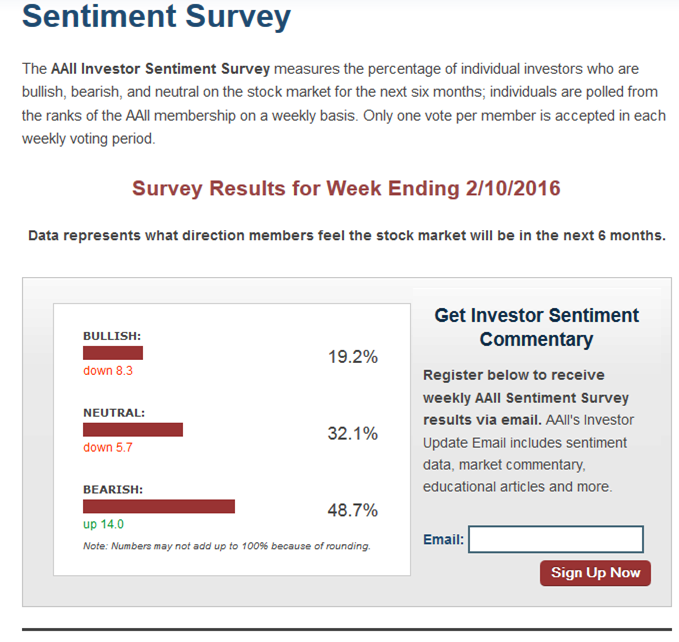 The key takeaway, however, is that the latest AAII Investor Sentiment Survey actually looks pretty bullish.